For one reason or another, it may be preferable to purchase an adult, trained dog rather than puppy. Most breeds have some form of rescue system which tries to accommodate any dog which has to be found a new home. This may be because the original owners have moved abroad or into accommodation where dogs are not allowed, because family circumstances have irrevocably changed; or because the owner had failed to realize the full demands of dog ownership and felt incapable of keeping animal. Whatever the reason, the fault rarely lays with the dog, and he or she will almost certainly relish a caring home. Breed rescue services can be found through English Kennel Club or the canine press. In addition, a large number of rescue homes are run by welfare societies, which often have a great variety of waifs and strays on offer. Buying a dog from a rescue home requires a level head un swayed by sympathy; follow the same check list for signs of health and disease in the puppy. Most homes will supply all available details about the dog, and with luck these will include the true reason as to why the dog is changing hands. If it is reputed to be destructive in the house, this may simply because it was bored through too little exercise or too little human company, or both. Such a behavior problem may be curable, but the dog must be taken on with the knowledge of such problems. It is also important to find out about the animal’s behavior with young children, and with other dogs, and whether it is obedient or willful. Its feeding, grooming and exercise requirements should be assessed, any known veterinary problems evaluated, and vaccination record, including certificated of vaccination if available, ascertained. Finally, be particularly wary and careful of a dog which has been re-homed several times; it may have been unlucky with previous owners, but the odds are against it. Before the puppy is collected from the breeder, a few preparations should be taken in hand to await his arrival. Garden fences and gates should be made secure, and swimming pools and garden ponds covered over until the puppy has come to realize the potential danger they represent. Garden pesticides should be stored out of reach of children and animals. In the home, take care to move tempting objects out of reach of an inquisitive puppy; he will chew anything lying around, especially leather and rubber objects. Loose, trailing electric wires and flexes can cause serious accidents; leather gloves and slippers will be chewed to ribbons in short while as will practically everything at the floor level, including newspapers and mail on the front door mat. Tidiness becomes an essential household task with a puppy around. Although a young puppy will spend much of his time sleeping, he will also want to play and should be encouraged to do so. A few toys are useful, provided that they are so large that they cannot be swallowed; squeaky toys may be too excitable. Avoid toys made from nylon and plastic, which are easily chewed by small teeth and on which the puppy may choke. For the first few weeks, little equipment is necessary apart from feeding and water bowls, some kind of bedding, and a few grooming aids. The breeder will have detailed the sort of food the puppy is already eating, and a small stock can be laid in; a vast quantity can be a mistake when the puppy discovers there is no longer a need to dash to the through. He may have to be persuaded before adjusts to the new regime. A dog must have its own food and water bowls, which should be kept apart from human utensils, even to the extent of using different washing-up bowls. Dogs are not unhygienic, but certain disease conditions can be passed from animals to man. Food and water bowls come in plastic, metal and heavy pottery. Large breeds have hearty appetites and need large bowls, and all types should be capable of withstanding proper sterilization by boiling; cheap plastic may warp into shapes unsuited for fluids. Metal bowls often attract the professional ‘chewer’, and plastic seems at times to hold fatal attractions; it has been known to disappear down the canine gullet, causing vomiting or uncomfortable impaction at the other end of the elementary system. Pottery bowls should be heavy and slippery so that they cannot be picked up and dropped; choose shape which cannot be easily overturned. A vast range of dog baskets and beds is available, varying from the strictly utilitarian to the frankly ostentatious. Owners may want to demonstrate their love for their pets by lavishing all manners of luxuries on them, but the majority of dogs want only a place of their own where they can feel secure and comfortable. Provided that they are protected from droughts many dogs hardly notice the room temperature, although this is obviously depends on the amount of coat; a thick-coated Golden Retriever will feel the cold less actually than the short-coated Bedlington Terrier, and a dog which has just his coat extensively clipped or stripped will appreciate warmth on a cold night. The first bed for a new puppy must be regarded a dispensable, and for this purpose a cardboard box lined with an old blanket is the most practical and economical. Alternatively, choose a type of bed which can easily be disinfected and cleaned. Cardboard boxes can be burnt, canvas sling bottoms on metal frames can be washed, but wicker baskets are difficult to clean after even a mild attack of vomiting or diarrhea and they are perfect for cutting the second set of teeth on! Delay investing in an expensive basket or bed until the puppy is past the chewing the stage. All dogs need regular and thorough grooming, and this should have been started before the new puppy is collected so that the process has become routine. Some owners turn grooming into a game, but it is all too easy allow the dog to win, and grooming can then become a constant battle of wills. All kinds of tools and equipment are available, including a range of brushes, combs, and clippers. A hound glove, which almost acts like a polisher, is suitable for smooth coats, while longer coats need a longer-handled bristle or wire brush, and a long-tined metal comb. Dogs get wet and muddy on rainy walks. They should be dried and rubbed down with a cost-off, thick towel after they have had a good shake, preferably in the garden. Hairy dogs have their own built-in cautions and probably will need feel the lack of blanket in their beds, but short-coated types, especially large, especially large, heavy breeds like the Mastiff and the Great Dane, tend to rub the sharp angles like elbows or haunches. Ideally heir beds should be cushioned with thick rugs, preferably man made which, though expensive, can go in the washing-machine time and again. The first collar should be lightweight and inexpensive; it will eventually have to be exchanged for a larger size and will probably be chewed by its wearer. Leather, either flat or rolled, is preferable to plastic, and the collar should be fitted so that it cannot slip over the puppy’s ears if he pulls back against it; the type of collar which forms a noose round the neck can be alarming for a puppy if the collar is pulled up tight, and it tends to fall off if left loose. Get the puppy accustomed to wearing the collar by fitting it for an hour or two at a time; after a time a lightweight lead can be attached to the collar and the puppy walked in the garden. Leather leads are satisfactory but easier to chew then metal ones; the latter should be of good-quality stainless or they will rust. In Britain, the law decrees that all dogs must have a means of identification attached to their collars; this can be a plastic or metal disc, or a small screw cap container with a paper insert. The owner’s name, address, and telephone number should be inscribed on either type; it is inadvisable to inscribe the dog’s name as this might help a thief to entice him away. It is also possible to tattoo a dog, either in the ear or either n the inside of the thigh, with indelible dye as an identification method. Most new owners will probably want to keep the pet dog indoors, but there is nothing against housing a dog outside provided that the kennel accommodation is drought proof, has a source of warmth, and can be easily and properly cleaned. An outdoor kennel should preferably have a run, fenced in securely from the rest of the garden and high enough to prevent the dog from jumping over it. 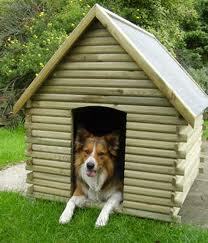 Fresh water must be available at all times, and the kennel should have proper sleeping accommodation. Thick-coated breeds do not need thick bedding, but shorter-coated types will be grateful for a comforting blanket. However, most owners feel that a family dog should live in the house, where it can participate in family life and be better able to carry out the role of protector of the property.